Happy 4th Anniv to my Lappy! It's been 4 years when I first got my hardwork from a company. Before I resigned I promised myself that I should invest a gadget so that when things got rocky I can say that atleast I got one thing I can use and reminds me my hardwork getting that thing. When I was still in college I always wanted to have a laptop or a desktop so I can use it at home for projects or even find job to earn extra money for my studies. An average worker can't bought a laptop at a cash basis, moreof if you are just a minimum wager just like me when I started working after my graduation. I was lucky enough to have the privilege to ask for a loan assistance when the company held a bazaar. So I hurriedly check out the items and surprisingly there was a laptop on sale! Eager to have one, I asked my cousin to be my co-maker so I can have this loan since I already computer the monthly payment and I still have some allowance left if I do so. Loan approved! I purchased the Gateway LT2002i, 10.1 inches in black. 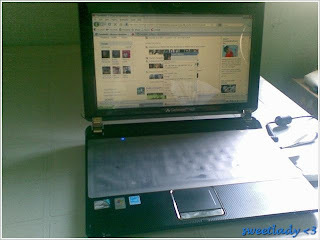 A sleek netbook that I can bring anywhere since I am just boarding and I can bring it whenever I go back to Batangas. sweetamz (name of my lappy) - 4yrs old already! It's been four years and I still have my lappy and feels like I've invested a gadget worth having for. I still have the box and manual with me. The netbook is still in good condition and the battery is working great as I've never use it from time to time unless I am travelling and just use the AC power to minimize the battery life of the netbook's battery. I used my netbook for like 10hrs maximum in a day because I am working at home and I remember I had it turned on for 24 hours just because I am downloading a movie. So imagine the benefit I got from purchasing this netbook, sulit na sulit! Most of the time, battery is the common issue among laptops or netbooks aside from the cooling fan. Some batteries drain out easily after using it for an hour, but mine can still be used for 5 hours. Tip: To make your battery life span longer, use it only whenever you go out and you already know that there is no socket in the place you're going to. If you are like me who is always working at home, I suggest you remove the battery and use the AC adaptor instead. The product is already phase out in the market. You can view the specs here: Gateway LT2002i. Gateway is a subcon of Acer. For more products check their website and eheck their specs first before considering on buying a gadget.